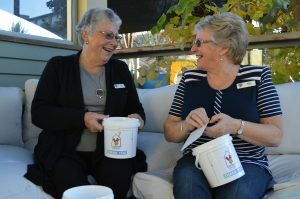 Volunteers are the backbone of Ronald McDonald House South Island and we simply couldn’t provide our services without them. If you have time to generously give, we can always use your help. Our volunteers tell us that gifting their time is hugely rewarding. The Ronald McDonald House Family Appeal is hitting the streets of the South Island on Friday, May 10. We will be looking for superstar collectors from across the South Island to raise funds to provide free accommodation and support for families who must travel to Christchurch and Invercargill for their child’s medical treatment. Corporates or Schools to take responsibly of a site for the day. Individuals to gift an hour or two of their time. Or drop off at Our Christchurch House Reception, 33 Cashel Street, Christchurch Central, Christchurch. If you are a corporate or community group and want to take part in the Family Dinner Programme, click here. If you are a group who would like to volunteer at the Christchurch House or Ronald McDonald Family Room, Southland Hospital, please contact Jemma. Please list any relevant experience you feel would benefit RMHSI and relevant to the categories you have chosen. We require two character references as part of our Volunteer Enrolment Procedure. These people are not to be family members. Our preference would be that you choose past or present employers if possible.